Welcome to the month of Iyar, and this month’s Yesod newsletter. Sefirat Ha’Omer (Counting of the Omer) – a daily count of the 50 days from Pesach until Shavuot. It’s a rollercoaster ride of moving from the memory of the Holocaust and Israel’s fallen soldiers to the highlight of the creation of the State of Israel, reflecting our ability to be a free people in a free land. 2018 is, of course, the 70th year since Israel’s founding so this will be a special celebration. In this newsletter we’ll challenge you to think more about your relationship to Israel: it’s meaning to you, and the impact it has on your programming and organisation. We know, though, that educating about Israel isn’t simple – it requires us to make significant educational choices, about the best topics to focus on, the developmental level of our learners, questions of how to deal with complicated political issues, and more. But there are many resources out there to help you, check out some of these below. Whatever you choose to do to celebrate Israel’s 70th Birthday we wish you lots of joy and many happy returns! Makom, has a useful framework to explore Israel based on the last line of the Hatikvah: To be a people, free in our land. They have video explanation and a brief summary that is a useful apolitical framework for yourself and for having conversations with others. The iCenter has developed The Aleph-Bet of Israel Education which highlights the best practices of Israel Education. Use them as discussion points for discussion with your colleagues. They also have a lot of Israel@70 resources. The Center for Israel Education, developed by Professor Ken Stein, Director of the Emory Institute for the Study of Modern Israel, has great self education resources. An extensive Jewish/Israel timeline with pictures, and various learning materials, themes and methodologies can be found here. Israel70: Building Artistic Connections is a great project designed for schools and museums and offers young people the chance to relate to Israel through art. 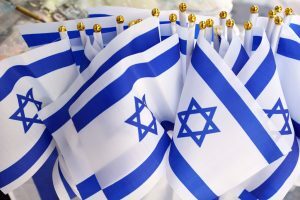 The National Library of Israel has fantastic primary resources on the topic of Israeli Independence and ready-made resource packs for educators. The Limmud Chavruta Project is delighted to launch the second in a series of five e-resources over the course of 2018 to mark Israel at 70, in partnership with UJIA. This Yom HaAtzma’ut, we invite you to study Megillat HaAtzma’ut (the Declaration of Independence) with us. Click here for the chavruta source.